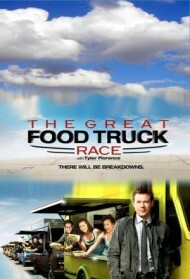 "The Great Food Truck Race" is back for a sixth season this August with a brand-new fleet of fierce competitors cooking and traveling across America's most famous stretch of road, historic Route 66. In a return to the show's roots, the seven teams are professional food truck operators from around the country who are known regionally for their culinary talents and selling skills - and they are ready to be recognized from coast to coast. The 2,500-mile, food-filled road battle kicks off in Santa Monica, California then hits Sedona, Arizona and Santa Fe, New Mexico followed by tasty stops in Amarillo, Texas; Tulsa, Oklahoma and St. Louis, culminating with an epic finale in Chicago, where the winning truck is awarded a $50,000 cash prize. Season 9, Episode 6 - "The Whole Enchilada"
The final two teams head back to Los Angeles, where Tyler welcomes them to the historic Pueblo de Los Angeles - the epicenter of L.A.'s Mexican heritage and culture. He introduces Bricia Lopez, co-owner of James Beard-award winning restaurant Guelagetza, and they explain the Mexican ingredients and flavors the trucks will be using in their final stop. First, the teams must create a dish using chayote, then Tyler and Bricia determine which team uses the ingredient best. For the final day selling, habanero peppers are the must-use ingredient and both trucks pull out all the stops for the win - but only one team is awarded the ,000 grand prize. Season 9, Episode 5 - "First Dates"
The final three teams head to Coachella Valley where in less than 24 hours, thousands of country music fans will be arriving for a massive festival. Tyler educates the team on Medjool dates, and after each team pits a pound of dates and sprints off in their truck, Tyler calls with another challenge: each truck must create and sell an original date dish to be judged by date growers Albert Keck and Melinda Dougherty. Sales spike during the festival and the race is neck and neck, but only two trucks move on to the finale. Season 9, Episode 4 - "Bordertown Boom"
The trucks arrive to the Old West Town of Yuma and head to the historic Arizona Territory Prison, where prisoners from all over the Wild West were sent. Tyler gives the teams an artichokes and bacon relay challenge, then they must add an original dish starring the two ingredients to their menu and start selling. The residents of Yuma show up strong, with lines of people twenty deep waiting for truck specialties. After a day of massive sales, one team is eliminated and the final three trucks head to the next destination. Season 9, Episode 3 - "An Oasis in the Desert"
The trucks travel to Phoenix and meet Tyler at a Sonic Drive-In for a blind taste test and original savory dish challenge inspired by Sonic's signature drinks. One team member is left operating his truck solo when his teammates leave the race, and the full day's sales in Phoenix is a close one, with the top four teams totals separated by less than . At Rawhide Ranch, the truck that made the least money is named and the four remaining teams move forward. Season 9, Episode 2 - "Shrimp and Glitz"
The teams hit Fremont Street in Las Vegas, and Tyler gives them a challenge using one of the most popular items on Vegas menus: shrimp. Each truck must create their own ultimate shrimp dish to sell right on Fremont Street, and the team that makes the most money wins a prime parking spot for selling the next day. Then Tyler and special guest Elizabeth Blau visit the teams and offer business and culinary advice. The teams sell their signature dishes on the streets of Vegas, and the least successful truck is eliminated. Season 9, Episode 1 - "Wagons Ho!" Tyler Florence welcomes the seven teams at a cattle ranch outside of Los Angeles. First, each team must hand-squeeze a pitcher of orange juice in order to receive their seed money and keys to their truck. Then, the trucks head out to shop and prep for their first day selling on the streets of Los Angeles, but Tyler calls with another challenge. Ultimately, the team that sells the least is sent home, while the other six head to the next city. Season 8, Episode 6 - "Battle for the South: The Race Through Savannah"
The final two food truck teams arrive in Savannah, and Tyler Florence's first challenge brings the teams out of the food trucks and into a new mobile selling vehicle: pedicabs. Each team has a half hour to make as much food as possible to sell out of their own pedicabs, and the team with the most profits gets 0 added to their till. Next, the teams travel through the city, where they sell head-to-head in new locations. At each location, they receive a new shellfish to include in a dish, and the team that sells the most fish dishes gets 0. Finally, Tyler reveals the team with the highest total till, the winner of The Great Food Truck Race: Battle for the South! Season 8, Episode 5 - "Battle for the South: Fresh Off the Farm"
The remaining three food truck teams arrive at a peach farm in Athens, Georgia, where they meet Tyler Florence and Athens chef Mimi Maumus. In the first challenge, the teams make a savory dish using the provided ingredients and peaches. The winning team gets to shut down the other two trucks for one hour at any time during the sell. Then, Tyler throws them a curveball while shopping and asks them for a completely fresh menu. The team with the lowest sales is sent home. Season 8, Episode 4 - "Battle for the South: Hot Chicken in the City"
Tyler Florence has a surprise for the four remaining food truck teams: a taste of the Nashville's famous hot chicken, prepared by Nashville native and owner of restaurant 400 Degrees, Aqui Hines. The teams sample and see if they can take the heat, then Tyler challenges them to make their own versions of hot dishes, but without chicken. Aqui tastes the dishes, awarding the winner 0 in their till. On the second day in Nashville, Tyler has the teams create their own self-promotion, much like the many artists in the city. Country singer Craig Wayne Boyd judges their promotions, rewarding the winning team with immunity. Season 8, Episode 3 - "Battle for the South: Sweet Home Alabama"
The remaining five trucks arrive in Tuscaloosa, Alabama, to find Tyler Florence and pastry chef Jan Moon waiting for them with a challenge: to crack the most pecans in just 15 minutes. The teams must then use their pecans in a dessert dish to sell on their trucks, with the winner receiving valuable mentoring time with Jan and the team that makes the most profits winning 0. On the second day in Tuscaloosa, Tyler challenges the cooks to a happy hour: for one hour, the pecan dishes will be sold for only, and the team with the overall lowest sales will be out of the competition. Season 8, Episode 2 - "Battle for the South: New Marching Orders"
Highest grossing teams from the first leg of the race pick teams to work with to feed 50 service members; teams with the favorite dish get 0 added to their final till; they hit the streets of Pensacola to sell their dishes. Season 8, Episode 1 - "Battle for the South: The Big 'Not So Easy'"
Teams must create their own version of a beignet and sell it in the French Market; whatever money they earn, they get to add to their seed money. Season 7, Episode 5 - "Family Face-Off: The Island"
The final two teams become hot dog vendors to compete for a distinct advantage; the trucks have to catch a ferry to Catalina Island; the families face off to see who will win ,000 and be crowned winner of The Great Food Truck Race. Season 7, Episode 4 - "Family Face-Off: A Dessert in the Desert"
The final three teams brave the sweltering heat of Palm Springs, Calif. as they take on a challenge of making something sweet to eat; the teams become human roadside attractions and create a costume to attract customers to their truck. Season 7, Episode 3 - "Family Face-Off: An Egg-cellent Adventure"
The remaining teams must face a challenge involving ostriches; the teams face setbacks in the Danish town of Solvang, Calif., where they're given a challenge steeped in the local culture; one team is sent home after a very close elimination. Season 7, Episode 2 - "Family Face-Off: Things Get Berry Interesting"
The teams take on a challenge of one sweet and one savory dish using locally-grown strawberries at the California Strawberry Festival in Ventura County; one team uses their family network to attract customers; another team can't get organized. Season 7, Episode 1 - "Family Face-Off: A Family Affair"
The race kicks off with a funnel eating contest at a theme park in Los Angeles; the families get their first challenge of creating the signature menu item; an all-out bidding war for a prime selling spot on the grounds of the theme park. Season 6, Episode 6 - "Showdown In Chi-town"
The two remaining teams arrive in St. Louis, ready for their final big sell. Tyler Florence challenges the teams to create three different dishes in 30 minutes to serve to two of the most renowned grill chefs in St. Louis, with the winner getting a valuable head start on the finale weekend. On their way to the Chicago showdown, they hit Springfield, Ill., for a Lincoln-themed sale. Once in Chicago, the teams have to hit three different ethnic neighborhoods with three different ethnic dishes. The team that first sells 50 dishes in each location will be crowned the champion of the Great Food Truck Race and drive away ,000 richer. Season 6, Episode 5 - "Roadside Attractions"
Season 6, Episode 4 - "High Steaks in Texas"
Season 6, Episode 3 - "Spicy Showdown in Santa Fe"
Season 6, Episode 2 - "Off-Road Eats in Arizona"
Season 6, Episode 1 - "Route 66: All-American Road Trip"
Season 5, Episode 7 - "Finale at Mile 0 - Winning Keys in Key West"
Season 5, Episode 6 - "Shrimpin' Ain't Easy"
Season 5, Episode 5 - "St. Louis Upsell"
Season 5, Episode 4 - "High Steaks in OKC"
Season 5, Episode 3 - "Dinner Dates, Austin Style"
Season 5, Episode 2 - "Hot Doggin' It in Tucson"
Season 5, Episode 1 - "Venice Beach Brawl"
Season 4, Episode 7 - "Capital Gains"
Season 4, Episode 6 - "A Food Truck Kind of Town, Chicago Is"
Season 4, Episode 5 - "Double Trouble in the Twin Cities"
Season 4, Episode 4 - "About Face in South Dakota"
Season 4, Episode 3 - "Pocatello Is All About Potatoes, You Dig?" Season 4, Episode 2 - "A Strange Brew in Portland"
Season 4, Episode 1 - "I Left My Food Cart in San Francisco"
Season 3, Episode 7 - "Where in the World is Lubec?" Season 3, Episode 6 - "Mistake by the Lake?" Season 3, Episode 5 - "Music City Madness"
Season 3, Episode 4 - "Baby Got Razorback"
Season 3, Episode 3 - "Even Food Trucks Are Bigger in Texas"
Season 3, Episode 2 - "Attitude at High Altitude"
Season 3, Episode 1 - "3,559 Miles to a Dream"
Season 2, Episode 7 - "Miami Heat"
Season 2, Episode 6 - "Midnight Truck to Georgia"
Season 2, Episode 5 - "Hog Wild in Memphis"
Season 2, Episode 4 - "Big Bites, Little Apple"
Season 2, Episode 3 - "Rocky Mountain Highs and Lows"
Season 2, Episode 2 - "A Pinch of Salt Lake City"
Season 2, Episode 1 - "What Happens in Vegas"
Season 1, Episode 6 - "New York Plate of Mind"
Season 1, Episode 5 - "Small Town Trouble"
Season 1, Episode 4 - "The Big Uneasy"
Season 1, Episode 3 - "Where's the Beef?" Season 1, Episode 2 - "Chile Santa Fe"
Season 1, Episode 1 - "Let's Get Rolling"